The horse doesn't do all the work. If you’ve ever stood on a wobble board, you have some idea how many muscles you activate to maintain your balance, and how much of a workout you get as a result. Now consider what that would be like if the wobble board was a 1200 lb animal with powerful muscles flexing as you race along uneven terrain. To stay in balanced rhythm with the horse (instead of gripping with your hands and bouncing around on the horse’s back), you have to activate your core muscles and flex your entire trunk. Trotting, cantering, and galloping a horse tones your muscles while giving you (and the horse) a cardiovascular workout. And that is why it is considered a form of exercise. So, using these numbers, let's say you decide to go for a nice, easy hour-long trail ride, alternating between walking (15 minutes total), trotting (15 minutes total), long trotting (15 minutes total), and cantering (15 minutes total). You would have burned 34 + 52 + 103 + 103 = 292 calories. If you had walked instead (at a rate of 3 mph), you would have burned an average of 260 calories. "This past weekend I did a difficult hour-long spin class at the gym and was shocked to realize that a recent riding lesson (walk, trot, canter, and a little jumping) burned almost the same number of calories!" Notice that reining and cutting burn different numbers of calories. 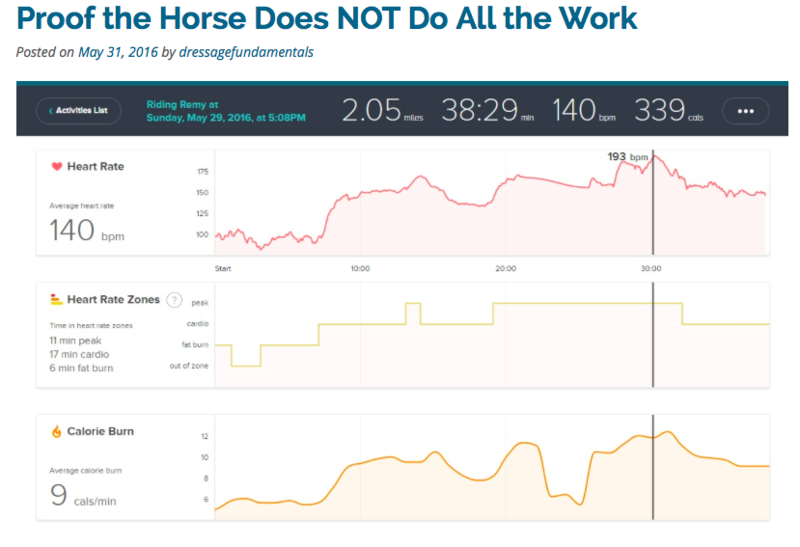 A dressage rider posted her Fitbit data online. While working her horse for only 38 minutes, she burned a total of 339 calories. 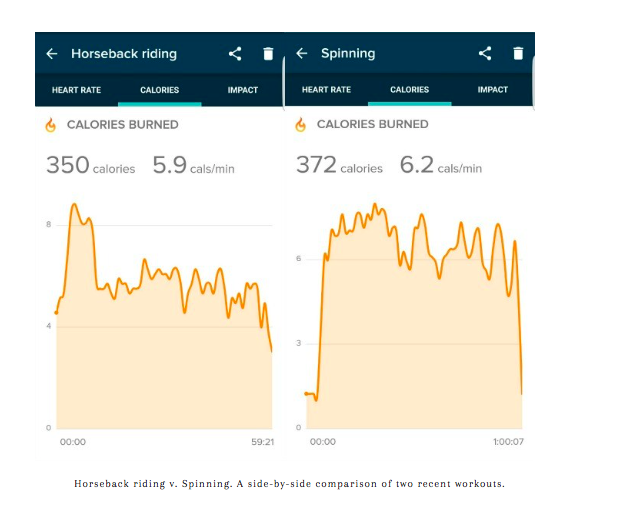 ​Another rider posted this: "This past weekend I did a difficult hour-long spin class at the gym and was shocked to realize that a recent riding lesson (walk, trot, canter, and a little jumping) burned almost the same number of calories!" Don't have a Fitbit? Here is a site that lets you enter your own information to calculate how many calories you burn while engaging in different types of activities based on your gender, age, height, and weight. I entered the following information, and here is the result.